Thank you Remezcla and Gracias a Telegrama!! Upon first glance, the guys of Telegrama look like Ivy League types. You know, the kind of guys who are bored of summering in the Hamptons because how passé, right? So, they decide to backpack through Eastern Europe after freshman year and then come back all bohemian-like, except you know they still send out their laundry and can’t prepare a meal more complex than a bowl of cereal. And this persona is exactly the one that Telegrama is playing up in their second album, the aptly-titled Country Club. 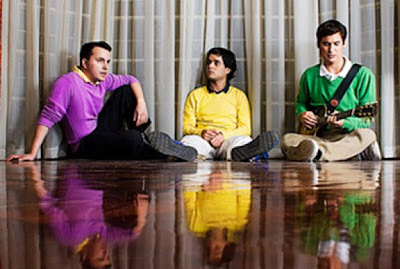 The blue-blood style trio, formed in Caracas in 2005, is (at least aesthetically) Latin America’s Vampire Weekend. In their golf-ready khakis and pastel polos, they cleverly pair tongue-in-cheek lyricism with even cheekier pop-punk instrumentation. Telegrama declares in “Jamas” that they will never change, no matter how hard anyone tries to change them. And you believe them in the way you believe your teenage sister, who is going through her rebellious phase. In “Prisionero,” which samples the Los Prisioneros anthem “We Are Sudamerican Rockers,” we encounter the familiar narrative of Creative Person becoming Boring Person when they get a haircut and a suit and the dreaded first office job. This is slightly frightening, but the storytelling makes it mostly just hilarious. You can download “Jamas” and “Prisionero” below (watch the unnecessarily angry “Prisionero” video as well) and let Telegrama soundtrack your next trip to the tennis courts. A mini mix full of multilingual goodies - French rock n' roll, German new wave, Spanish pop, etc. A mini mix exclusively created for RetailDJ.com. Get ready to go out with this! An unofficial Runaways soundtrack brought to you by Amylulita, Hollis James, Maria Blueghost, and Georgi Crespo!!! Dedicated to 50's/60's Rock n' Roll & Rockabilly in Spanish and English. Dedicated to multilingual-eclectic-italo-weirdness (German, English, Spanish). Dedicated to Club pop and electropop. Dedicated to indie rock and pop. Rock n' Roll y Punk Rock! One of my very 1st DJ mixes. HAWT NEW MUSIC VIDEO! The Fire and Reason! Open up and say "Ahhhh!" new mini-mix for grabs! Feliz cumpleaños Frida Kahlo. Te amo! Rad Art Work: Graffiti from Chile! I HEART MENEO - Music video: "Quiero"